The goal of the Fincher Hall Project is to provide new materials and equipment for the library at the Arkansas School for the Blind and Visually Impaired (ASBVI). Fincher Hall is a residence hall for freshmen at Southern Arkansas University. In addition to university studies, students in Fincher focus on leadership development and service learning. The SAU graduate level Library and Media Information Specialist (LMIS) program brings students to campus every summer. These librarians live in Fincher Hall during their four weeks of coursework. ASBVI students are missing out on the new technologies that would allow them access to library holdings. Much of what is currently in the library hasn’t been changed in over 15 years. During the 2010-2011 school year Fincher Hall students will conduct a library renewal campaign on behalf of the ASBVI. During the summer of 2011, LMIS graduate students will spend 10 weeks updating the ASBVI library: evaluating current materials; discarding worn and out-of date materials; evaluating the use of space to make materials more accessible to students; recommending books and new technologies to be purchased. ASBVI staff will use funds raised by the Project to update the library. Welcome to Talley! We currently house 148 male and female students. Although the majority of the Talley residents participate in the Agriculture Learning Community, we also have 3 other residential interest groups (RIGS) Education (Men), First Year Experience (Men), and the Brothers Under Christ fraternity. For the last 5 years, we have been building on the family atmosphere that makes this residence hall so special to those that call it home. When you enter the doors of Talley on a regular day, you’re usually greeted by hellos and the sounds of residents roping the calf dummy. This is a popular sport within our walls since a lot of the residents are also on the rodeo team here at SAU. The Talley Hall Luau – was a campus wide event in which we played horseshoes, volleyball, and grilled over 100 lbs of food for around 175 students and faculty. Movie Night – each Wednesday night during the semester, we watched a current hit movie in the lobby. Talley’s Got Talent – talent show geared toward students that wanted to show off their musical instrument capabilities. Any talent was welcomed. The Horseless Rodeo – this program was held in the lobby with a main event of calf roping. We had a sound system, a public address system, and a scoreboard. There were 65 teams entered into the contest. Mood of the Day Project – hosted on the girls wing of Talley and designed to promote community and closeness within our female residents. The Penny War – was a campus wide event for the residents halls to compete on the amount of money they could raise for a homeless shelter. We raised roughly $50.00 in penny’s. We also had a successful run competing with the surrounding Residence Halls and Organizations across the campus in various events this past semester. During Family Day we took 2nd place in the 30th Annual Bed Race! During Homecoming Week we won 1st Place in the Street Painting, 1st Place in the Banner painting, and 1st Place in Homecoming Display! We participated in all the Homecoming events and was named 2010 Homecoming Grand Champion!! We also took home 1st Place in the 13th annual Chili cook-off. It’s been a great year for Talley Hall thus far and it’s all been made possible by a great staff and even better residents. “ Fun loving and quality living.” – Tyler Cornett, Arcadia, FL. “It’s never dull or boring and there’s always something to do.” –Joe Bass,Ashdown, AR. “The closest thing to home at SAU.” –Joseph Gorman,White Hall, AR. “Talley has been a fun environment from roping in the lobby to movie nights.” -DJ Dickinson, Bargersville, IN. Most of the residents of Talbot Hall have the opportunity to participate in a program called Muleriders for Movement. This program is a way for the men of Talbot Hall to give back to the community and become role models to the young students of Magnolia. The program is set up for the residents to go into the local elementary schools and participate in the physical education lesson of the day. The hope is to promote the importance of physical activities. Talbot Hall plays host to one of the biggest Super Bowl parties on SAU’s campus. The guys all had a great time and the refreshments were gone in minutes. The conversations became heated as these men pulled for their favorite teams as they fought for the biggest championship on the biggest stage. It was a great night! The guys of Talbot Hall have also started up a Monday night Bible Study group. The group is made of a diverse number of residents that come from all different backgrounds but have a shared belief in their common faith. This program is a great way for residents to connect with one another on a deeper level. The group is open to anyone that would like to participate. Professional speaker and author, Paul Vitale, spoke to the Leadership College and Residential College on Monday, February 7, 2011. Beginning with the question “Do you consider yourself a leader?” Paul led the group in an interactive discussion of the Urgency of Leadership. If your actions inspire others to dream more, learn more, do more, and become more, then many would consider you a leader. Paul demonstrated the urgency of leadership by showing five thought-provoking videos dealing with current issues. In technology he led the group to react to a video on internet trolling. A discussion of courageous leadership was the highlight of social issues. In health issues the group discussed huffing among today’s youth. Tyler Thrapp from Texarkana, TX and Rachel Brantley from Magnolia, AR are the 2010-2011 Male and Female Residential College Members of the Year. They have demonstrated leadership through service and willingness to work with the Residential College and with the community. Rachel Brantley(right) is presented her RC Member of the Year award by Larry Graham, HA in Fincher Hall. Tyler Thrapp(left) is presented his RC Member of the Year award by Kash Wacaster, RA in Fincher Hall. Anthony Earl is presented the Heidi Hoglund Spirit Award by Larry Graham. 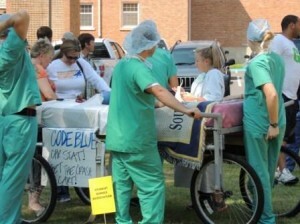 RHA is hosting its 32nd annual Bed Race. Students will spend the week designing, decorating, and hopefully racing twin sized beds in front of an eager Family Day crowd. In a double elimination show down, each team, consisting of four runners and a rider, races down Crescent Drive until there is only bed is left standing. The overall winner is presented with the treasured Bed Race trophy. Awards are also given for most creative, most original, and best craftsmanship. This time honored Family Day tradition was started 1981 and has taken place every year since. Jessica Anderson recieves the 2011 RHA Achievement Award from former recepients, (from left to right) 2010 Eric Engelberger, 2005 Billy Bethea, 1993 Veronda Tatum, 1987 Kim Anderson, 1985 Bob Martin, 1984 Allen Blackwell. At the 30th Annual RHA Banquet, Jessica Anderson received the highest award, the 2011 RHA Achievement Award, for her dedication and contributions to the Residence Hall Association. Jessica is a senior early childhood education major from Ben Lomond, AR. RHA hosted its 31st Annual Honors and Awards Banquet on April 5th, 2012. It was a great success with many awards given out.